If you’re anything like me, you love the idea of buying a new guitar. Going to stores and playing around with what’s in stock and trying different guitars is something I could do, and often have done, for hours. However, when it comes down to actually making a choice on which one to buy, it becomes a lot more difficult. Especially you’re searching for a beginner guitar. First of all the difference between the different types of wood. Then the different types of pickups. Next looking at string styles. Also comparing body types and hardware, etc. It goes on, generally, I feel like I have to be a luthier to understand any of it. So we at Buzz Harmony decided to go through the choices. We talked with professionals. As a result, we created this guide so you can understand the difference between having a mahogany body and a maple body. We’ve also included a style assessment at the end to help you figure out what style of guitar will most meet your needs, along with a couple recommendations of our favorites. The thing that makes choosing a guitar so difficult is how there is no real right or wrong answer. First of all, this may sound daunting when starting out, but it’s actually liberating because it opens the world of sound up for you to experiment and discover. So the first thing to do is to ask yourself: What type of music do I want to play? Start by asking what two genres do you think you’ll be playing the most often. Is it rock, or jazz, or maybe metal? Next ask yourself what style of guitar do you want to play? Are you all about the solos and leads? Or do you want to focus on rhythm guitar? Maybe you’re looking to do acoustic finger-picking? Third, ask yourself what your budget is? If this is your first guitar ever we highly recommend staying close to the $100 range. No sense if spending a ton of money on a Les Paul and find out you don’t have the patience to play guitar. If you know you’re committed to guitar then it may be time to up the ante. Finally, where are you going to be playing most of the time? If you’re looking to do shows and perform you’ll want to be heard, but if you’re just playing around the house and with a couple of friends you don’t need a ton of sound. Now we can really get started with trying to find the right guitar. Since the body is going to be the foundation for which all the rest of your sound is going to be developed. So the next question is quite simply: Electric or Acoustic? There are many different types of electric guitars to pick from out there, and you want to pick the one that will fit your style and needs as a player. Among the vast array of guitars available is an assortment electric guitar types. Not only will the guitar body types vary in size and feel, but they will vary in sound as well. Use this list of guitar types to help you choose what is best for your music to be the next jukebox hero. Click here for our Ultimate Buying Guide for Electric Guitars. Because the sound of an electric guitar is influenced by pickups, effects, amplifiers, and speakers, the effect of specific woods on your tone can be much smaller. If you play with a lot of distortion and other effects, like a flanger, it will be very hard indeed to hear the difference between an alder and an ash body. However, if you prefer playing more cleanly you will find the differences to be more readily distinguishable. Most electric guitars have a simple construction of a body piece, a neck piece, and a fretboard. These are your solid bodies. A solid-body guitar has a body made of solid wood, and may or may not have a top. The top is just a thin piece of wood glued to the body for both looks and tone. Some electric guitars, called arch tops (or hollow body), are essentially acoustic guitars with pickups in them. They have similar construction, all of the same parts, and can be nearly as loud unplugged. 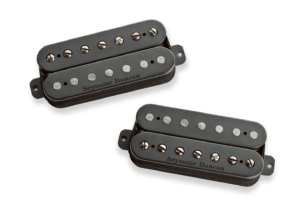 However, because they are designed to be amplified with magnetic pickups, the choice of wood tends towards those which produce a brighter tone, because that translates better through an amplifier. Additionally, because they vibrate so much, archtops are very prone to feedback. A semi-hollow guitar has a solid wood tone block in the center to which the pickups and bridge are normally mounted. The rest of the body, called the wings, is built like an archtop but usually much thinner. These guitars combine some of the look and sound of an archtop with the strength and feedback resistance of a solid body. For more detail on the types of electric guitar bodies read more here. There are a wide variety of acoustic guitars out there. To the untrained eye, they could all look too similar to tell the difference. Click here for our Definitive Buying Guide for Acoustic Guitars. So we’ve put together a comparison to help you spot the difference, and more importantly, understand how that affects your buying decision when looking for an acoustic guitar. 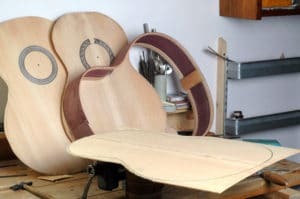 Let’s start with the parts of an acoustic guitar because it’s easier to understand how the choice of wood will change the sound of the instrument. An acoustic guitar has two main parts, the body (or sound box) and the neck. The body is what amplifies the sound of the acoustic guitar. While the neck holds the fretboard and supports the strings. The body of an acoustic guitar has a top, a back, and sides which are reinforced with bracings. Bracing patterns can have a dramatic effect on sound because of how much they let the guitar resonate vs. structural strength. Since the strings are connected to the top fairly directly via the bridge, the top is what vibrates the most and has a huge impact on the sound. The back vibrates too, and also contains the moving air so that the whole guitar keeps vibrating. The sides mostly hold the two together and provide structural support, but they also vibrate as well. On an acoustic guitar, it is unusual for the top to be made of the same wood as the back and sides. Combinations are more common, to combine the best attributes of certain woods. The neck supports the strings and the fretboard. 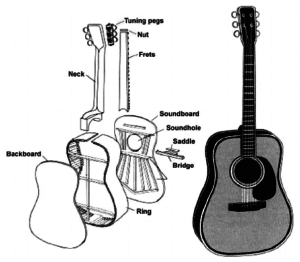 Since the strings only touch the guitar at the bridge and a fret (or the nut), those are the only two parts of the guitar where the energy of the vibrating string is transferred to the wood of the guitar. Ideally, the string would transfer no energy to the neck and instead transfer all of its energy to the top. Therefore, a good neck should have as little resonance as possible, so it absorbs as little energy from the string as possible. It should also be stiff, light, and strong for playing comfort and tuning stability. To this end, some manufacturers have started adding carbon fiber stiffening beams to necks. The same principles of resonance apply to the fretboard. However, the look of the wood can also be important. A jet black ebony fretboard is some people’s idea of perfection. While others prefer the complex figure of a piece of birdseye maple. For a better look into the Acoustic Body Types check out the article here. Tonewood is an important factor to the sound of your guitar. Learning how they correspond will help you gain a better understanding of guitar sounds, especially in an acoustic. It will also get you one step closer to really understanding what you’re looking for in your style. Plus why one guitar is $300 and another is $3,999! It is also a higher level aspect of picking your guitar and one that you don’t need to worry about a lot if you are a beginner. For our full in depth article about tonewoods read our article here. Guitar strings are something you’re going to be going through more than anything (except maybe picks). 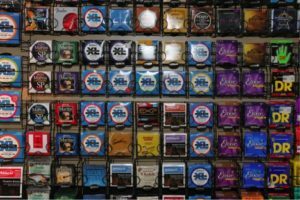 So you’ll want to know what all those different packages mean on that wall in the guitar store. The good news for beginners is that on the whole, as long as you grab a set of strings meant for your guitar you’re going to be fine. 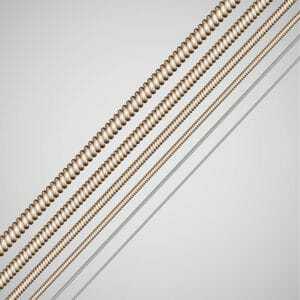 Think electric strings for electric guitars and nylon for classical, etc. The important things to know are simply that only two things change on guitar strings: the gauge, and the blend. Both have an effect on the sound and durability of the strings. First, the easiest thing to remember with gauge is the heavier the gauge the more sound you can expect to generate, while the lighter gauges will sound more crisp and bright. So a heavier gauge is going to be needed for heavier usage. For example, dominantly strumming styles versus finger-picking or lead guitars. However, if you’re looking for a middle ground then “medium gauge” is going to be your friend. A strings blend is what combination of metals are used and in what ratio are they used. You may hear the phrase “80/20.” this is a standard for acoustic guitars and means the metals are a combination of copper (80%) and zinc (20%). The wide variation comes into play when looking for different gauges and different material compositions which fine tune guitarists playing style. Read more to find out what type of strings you should be using. The pickup is going to be an important factor in determining the sound and tone of the guitar. With an electric, it is one of the most influential to sound. On an acoustic, it’s important to understand how different pickups will alter the sound when plugged directly into an amp. 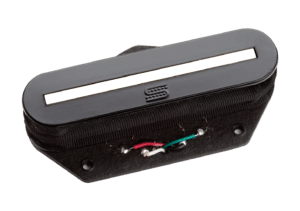 The most common pickup you’ll encounter is the magnetic pickups for electric guitars and piezo (or contact) pickups for acoustic. For your electric and understanding the magnetic pickup there are really 2 choices you’ll encounter. The single-coil and the double-coil (often called a humbucker). The major difference between these two is that the single coil usually produces a brighter and crisper sound. However, they are more susceptible to feedback. Whereas a double-coil produces a richer and fuller sound with a higher volume. There are a bunch of other factors that can play into the sound of your pickup. Such as placement, materials used, wrapping, and whether it’s a blade or pole setup. For a beginner just understanding the difference between singe and double coil is a great start. Read on for our more in depth look at pickups! Having the right gear and accessories can add extra dimensions to your playability and sound. We’ve put together a list of essentials that no guitarist should be without. Read to get our personal gear recommendations.